Apple and Google stand out as two highly successful Silicon Valley gorillas at the top of their game. In the past, their products were complementary but they’re now doing battle in mobile phones, mobile search, digital books and the new tablet market. Both companies target individuals over corporations yet how they grow and reach wider is very different. The below chart is based solely on my observations with the exception of their missions. 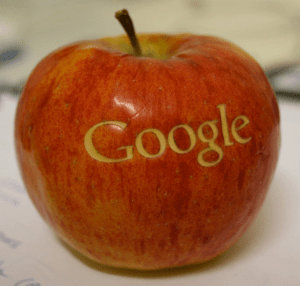 Google’s comes from their web site and Apple’s is based on a talk by their COO, Tim Cook. In an information economy, Google’s mission is potentially limitless whereas Apple’s focus on products within selected markets is conventional. One factor that enables Google’s mission breadth is that advertisers generate 96% of Google’s revenue while most users pay nothing. With Internet advertising still growing and mobile advertising just beginning, there is a torrent of money flowing into Google that funds lots of experiments. The Google product page has over forty wide-ranging applications from translation to 3D modeling tools. Google reminds me of a child blowing on a dandelion seed puff. Experiments are launched, watched and tweaked until they wither or take root. Since they’re free to users, the hurdle to try them is low. In sum, Google’s mission drives them wide and their huge advertising revenue stream supports a high level of experimentation. Apple customers pay a premium price for their products. The premium necessitates products that deliver a compelling and differentiated customer experience. To achieve this, Apple owns what it considers critical technologies, operates in secret and tightly controls who and what interacts with each product. This takes intense focus, careful new product selection and their renowned passion for creating “insanely great products”. The internal implications of Apple’s single-minded focus contrasts sharply to Google’s experimentation practices. Google allows its employees one day a week to pursue projects outside their defined role, whereas Apple strictly limits employee access to new product development teams. Implication: Revenue models where a third party (e.g. advertisers) pays for what customers receive for free are rare. Therefore as compelling as Google’s prodigious experimentation may be, most companies can’t afford it. Apple’s strategy, expanding current boundaries one step at a time, is more conventional but the specifics are unique. Apple takes risks that cut across the grain of most companies. How many consumer product companies do you know that are willing to give up consumer testing? Apple’s penchant for secrecy effectively prohibits consumer testing. In its quest for design leadership, Apple often reaches beyond current practice just a step sooner than expected. (e.g. Adobe’s Flash is the current video standard on the Web yet there’s no support for it in the iPad). To deliver their legendary ease-of-use, Apple hides or omits features and functionality that limit what customers can do. Winning with a “less is more” strategy leaves little margin for error. In summary, Apple is grand touring car such as an Aston Martin. It’s gorgeous to look at, very powerful and while not as lightweight or agile as a Ferrari, it is much more comfortable to operate. But you can’t and wouldn’t want to maintain it yourself. Google is the latest 4×4 hybrid that goes anywhere. It’s got GPS integrated with Google Maps and Facebook that also tells you which of your friends are nearby. With its gazillion ports and options, you can customize and re-program nearly everything. How each enters new markets is very different. Andy Grove describes Apple’s entry into the music business as a “cross-boundary disruptor”. At the time of the iPod’s launch, the music industry was in shambles as labels struggled to preserve CD sales from pirate copying at sites such as Napster. Apple approached them with a new business model imbedded within the iPod/iTunes product. iTunes would protect, distribute and load digital music on the iPod but at a cost. The cost went well beyond the cut Apple takes from each sale on iTunes. By allowing users to buy individual songs for $.99, Apple shattered the labels album-based pricing model. Now users could buy only the songs they wanted. For consumers, the combined iPod/iTunes technology made it easy to buy music legitimately and load it without having to master much technology. Apple showed the same sensitivity to current stakeholders when they cut a deal with book publishers for the new iPad. Equally challenged by the threat of digitization, Apple was able to crack into Amazon’s deeper and long standing relationship with publishers by granting them the ability to set their own price. This gave publishers a weapon to push back against Amazon’s Kindle pricing of $9.99 per book which they feared would become a standard. Apple inserts itself into cracks within the current industry structure, provides a technology based alternative and takes its share but doesn’t vanquish the incumbents. Google’s engineers worship at Our Lady of Technology Progress where every step forward is considered divine. Google’s mission of organizing the world’s information transcends current stakeholder roles, revenues or investments. Thus when Google enables users to “mash-up” content from multiple newspapers and information sources to create their own home page, they think of that as progress that’s “really cool”. To the publisher who’s paid sources to find, write and package the story which Google takes at no cost, this is thievery. Google’s infamous slogan “Do No Evil” comes across as naively narcissistic to established content providers. Google banks on the inevitability of information technology progress. They are like the economists who remind us that current debt levels in many western nations are not sustainable but can’t tell exactly when and what the consequences will be. Fueled by their massive revenue from advertising, Google, can afford to be persistent and patient. Microsoft had a similar advantage as they funded the birth of their Office and Server franchises from Windows revenues. Not surprisingly, both companies are often described as arrogant by their critics. Implication: Apple grows by wedging its way into new markets and tackling known problems with easy to use technology. In music and mobile applications, they’ve leveraged their powerful brand and customer loyalty into a controlling position. In the forthcoming battles in mobile phones and advertising, will Apple continue to deliver a significantly higher customer experience from which they can extract a premium? Technology in mobile changes faster plus the relationship between handset manufacturers and service providers is constantly shifting. Nokia, Blackberry, HTC, Amazon and now Google are very viable competitors compared to what Apple encountered in the music industry. In contrast, Google crosses industry boundaries using virtually free applications that are easily adapted and initially, non-threatening. The question for Google is can they expand beyond the base of early adopters and build a new revenue stream comparable to search? For example, Google Apps is a cheaper, cloud-based office suite that could replace Microsoft Office but today offers fewer features. According to market data released by Forrester Research on 5/11/2010, 81% of the firms it surveyed are running Office 2007 and only 4% use Google Apps. Google Apps could become disruptive as it closes the functionality gap with Office. Google works wider by drawing a big circle and scattering free coupons inside. Blessed with a revenue engine that enables them to watch and wait, one has to remember that’s exactly how they transformed search into the massive advertising revenue generator it is today. They are betting that their engineers, combined with enormous volumes of data from search, and tenacious hard work will cause at least some of these widely scattered seeds to take root. Apple wields a sharper strategic knife, slicing one step at a time. Each step deepens its brand and customer loyalty. Their challenge is as they move further away from computing into consumer products, services and the mobile world, can they continue to maintain the tight control that delivers a premium customer experience, and extract a premium for it? The upcoming battles in mobile, books and tablets will tell us more.